mini-space shuttle on a classified mission has finally returned to earth. It landed early Saturday morning at Vandenberg Air Force Base in California at 5:48 a.m. PDT after weather conditions kept pushing back landing attempts the last few days. The shuttle spent 469 days in orbit. 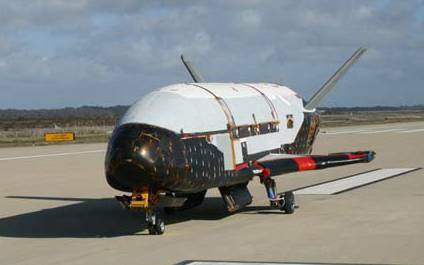 The Air Force's X-37B, is an unmanned reusable spacecraft built by Boeing that has spent more than a year on a classified mission in space. Measuring 29 feet in length and having a 15-foot wingspan, the unmanned reusable X-37B Orbital Test Vehicle looks like a miniature version of NASA's now retired space shuttles. The craft went into orbit on March 5, 2011, but as was the case during its first launch in 2010, very little has been known about its mission or what payloads it might be carrying because its missions are classified. That has led to speculation that the spacecraft is involved in intelligence gathering operations or the testing of new technologies. In keeping with the scarce mission details for the X-37B, all the Air Force would say in a statement Saturday was that the spacecraft had "conducted on-orbit experiments" during its mission. Lt. Col. Tom McIntyre, the X-37B program manager said, "With the retirement of the Space Shuttle fleet, the X-37B OTV program brings a singular capability to space technology development." He added, "The return capability allows the Air Force to test new technologies without the same risk commitment faced by other programs. We're proud of the entire team's successful efforts to bring this mission to an outstanding conclusion." Even the initial announcement about an upcoming landing details kept the details vague. A May 30 Air Force statement said the spacecraft would return to earth in the "early- to mid-June time frame." 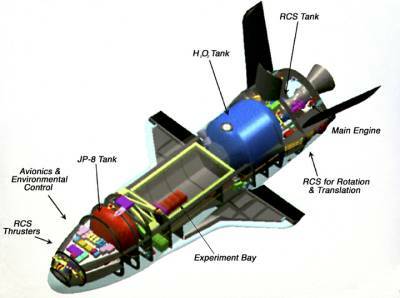 Designed to stay in extended Earth orbits, the X-37B remained in orbit for 224 days during its maiden mission in 2010. This mission kept it in orbit more than twice as long this time around. An Air Force statement announcing Saturday's landing says the X37B will launch again later this fall aboard an Atlas V booster.